Firstly, Happy Easter! I hope you are all enjoying your long Easter weekend. Secondly, I have some good news, Little Miss decided to make an appearance (hence why I haven’t been around for a while). We love her, she’s such a little sweetie and Little Man loves her too, which is very good. Anyway, getting back to this weeks blog. All of you in the UK will know that the last few weeks have been very cold over here. When I say very cold, I mean there has been snow on the ground (and believe me, in London, that is an achievement!). On a side note, we found it mildly amusing as when Little Man was born it was just as cold and there was also a lot of snow (he was born in the middle of Winter). We never thought we’d need snow suits and warm blankets for Little Miss (last year in March we had a mini heat wave). Anyway getting back to what I was saying (I’m so easily distracted!). I thought that this ‘Folksy Friday’ post should be a crochet blanket special. I have to say that all I want to do at the moment is to curl up under a lovely warm blanket. My first blanket is my the lovely Lucy Welsby. I love the mix of colours and the diamond effect. 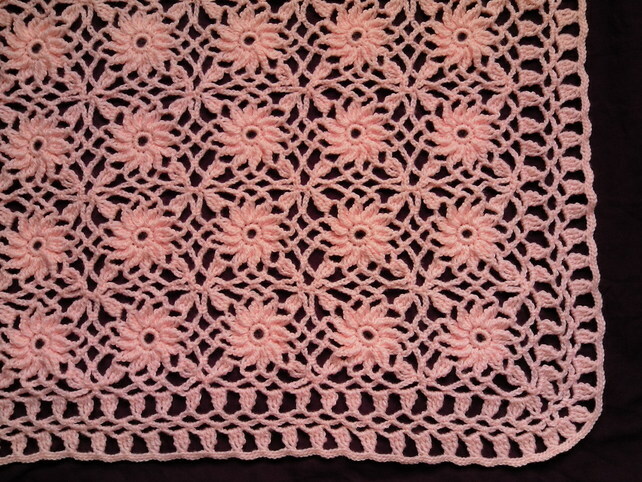 It would make a beautiful baby blanket or the perfect lap blanket for those chilly nights. 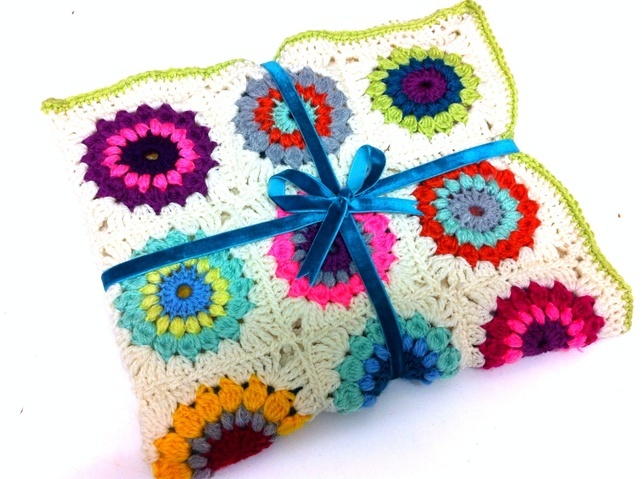 The second blanket is this beautiful ‘granny square’ blanket by The Sunroomuk. 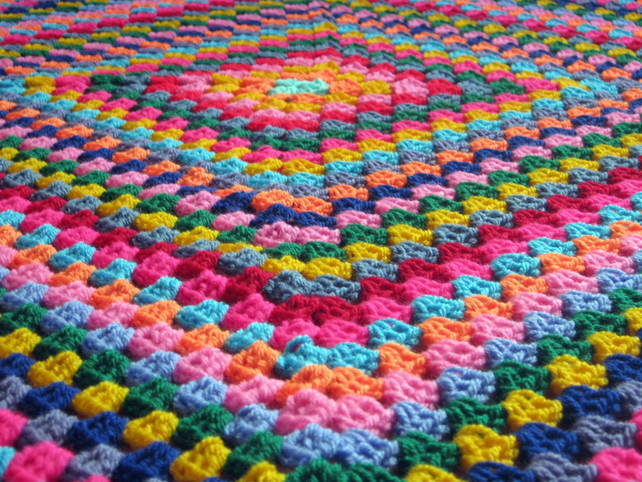 I think why I like this blanket so much is the use of bright colours which go beautifully together (I’m always envious of people that can team up bright colours like this as it is not a gift I have). 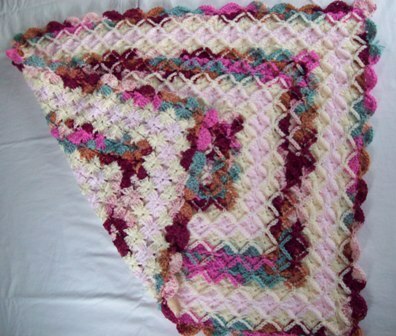 I think this blanket by Frank&Olive Crochet looks really warm and snuggly. I think the circles in the squares in are really effective. I also like the bright colours on the white borders. Lovely. When I saw this blanket by EileensCraftStudio I fell in love with it. I know that it is a knitted blanket but I think it’s really effective and I love the crochet detail worked into it. When I look at it I can imagine being wrapped up in it or throwing it on one of my little ones beds. It really has the feel of a family favourite! 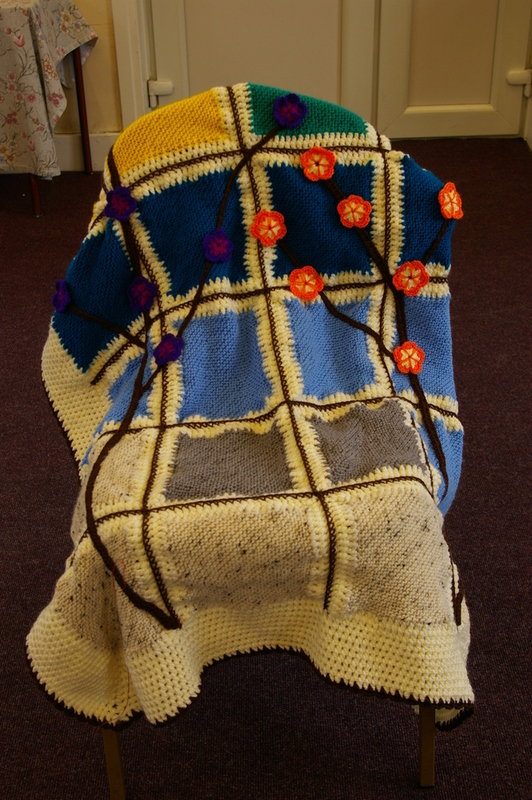 The final blanket is by Tatjana474. I’ve just started crocheting some lace items but this is truly stunning. I would love to get to this standard! It’s so pretty! Well I hope you’ve enjoyed my Folksy Friday post. I have no idea when I’m going to be able to blog again but I do have some ideas floating my head. Hopefully by the time I get round to it Spring will have well and truly made an appearance! Congratulations on the arrival of Little Miss! I am so happy for you, how much fun will you have making beautiful girls things!